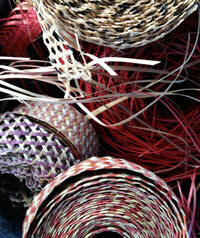 Oramae Pinder is the president of the Long Island Authentic Crafters Association of Long Island, The Bahamas. She has been a primary school teacher for over 40 years, but a traditional plaiter (straw craft artist) for even longer having learned the art form from her mother as a little girl. In an interview with us she described how her and her siblings would have races to see who could plait the fastest. With plaiting being a primary pastime, they became expert at a very young age. 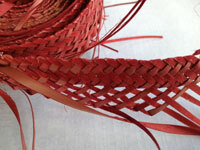 Plaiting uses the palm fronds of the "Silver Top" palm tree which then are dried and woven, sometimes dyed or scorched for color. The traditional designs endure from generation to generation with names like fish pot and peas'n'rice. In our interview she talks about the goal of the Long Island Authentic Crafters Association. "We try to use Bahamian stuff." Endeavoring to make their craft truly unique, the organization incorporates seeds and barks that are found no where else except this island. View our interview with Oramae. In our many visits to the island, Oramae and her sister Dyllis were kind enough to show us the basics of what they do. Oramae has lived on Long Island all of her life and is married with two children.